This is my 3d-printed Covenanter cruiser tank of 1941. 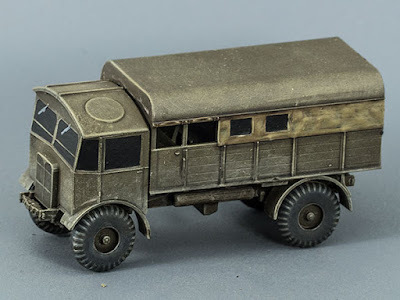 This one is printed in WSF nylon by Shapeways, and though I think it's OK for tabletop use, I'd like to get one printed in FUD resin, as a lot of the rivets and hinges and things have been lost or softened a lot in the lower resolution material. I'll probably replace the gun barrel at some stage with one turned down from brass rod. Photos may be clicked upon to embiggenate. Now I've finished flocking Mount Anthracite, and photographed it out in my rather overgrown back yard. 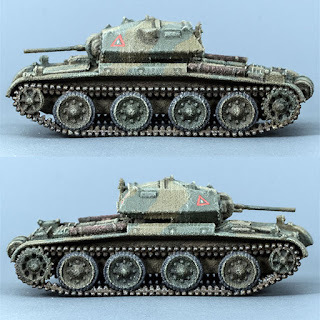 The 15mm T-28 is from Battlefront, and is included for scale. I called it Mount Anthracite because when I first sprayed it all black, it looked just like a pile of coal. It's a bit less anthracitic now, but I'll keep the name nonetheless. I may or may not add some more vegetation to it, depending on my whim. It's quite usable just as it is. There are basically three levels of spaces for figures to stand on, though in many places those grassy ledges are too narrow to support anything bigger than 6mm. 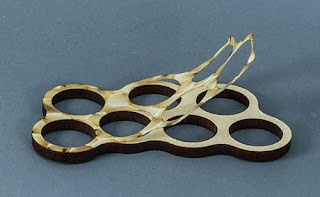 The length of the piece is roughly 800 – 900 mm. Moving on to a somewhat different style of hill now; this one is supposed to be a jagged rocky ridgeline rather than the smoothly eroded grassy hills I've done before. There will be patches of grassy flock here and there, but it won't be nearly as all-covering as before — there will be almost none on the tops, for example. Rather than being carved and torched to smooth off the foam, this one has been shaped by stabbing into it and breaking lumps off. The rubble and boulders around the base are some of these chips, stuck in place with acrylic caulk. That leaves quite a decent faceted rocky look, which I then over-painted with texture paste and sprayed solid black. This is the first of three layers of dry-brushing. The first, darkest tone covers most of the surface, but leaves some of the black showing through. I want a dark, rugged look to the finished piece. The second and third layers are progressively lighter tones of the first, with the third (and top) layer being almost — but not quite — white. 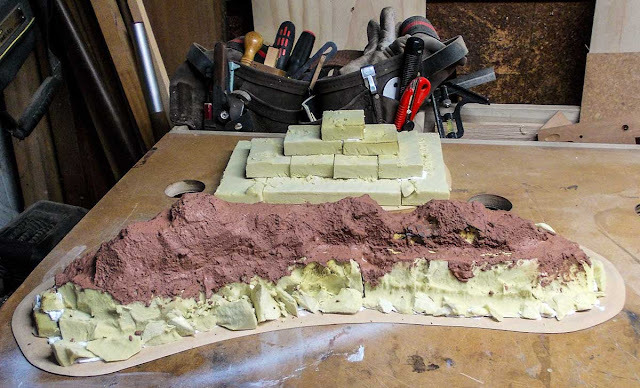 Each layer is applied more lightly, with the last just outlining facets of the rocky structure. This shot from above shows up the layers of the construction, highlighted by the dry-brushing. There are quite a few places where figures can be stood, but there are many more places where they cannot — this is intended to be mostly impassable terrain, and even for infantry I'd deem it too dangerous for any without alpine training. 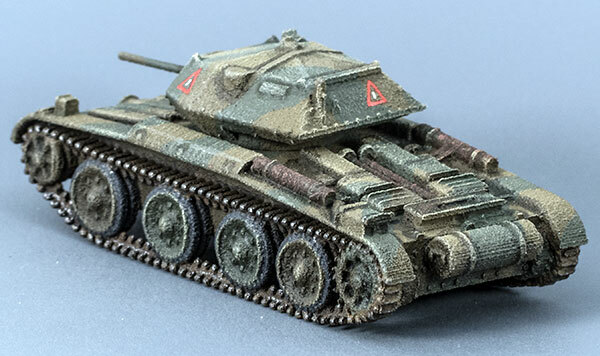 The Burford-Kegresse MG Carrier is a 3d-print, designed by me and made by Shapeways. I've tried to make this hill as playable as possible without being too absolutely geometrically regular. It's not terribly naturalistic, but it does look something like some ancient fortification sites I've seen. It's a series of terraces or ledges, so individual unsupported 15mm figures will stand all over it without too may issues. Finding a happy medium between naturalism and usability has been rather difficult. This is my best effort yet in that regard, but I think it could be better — the continuous runs of the ledges tend to draw the eye, and maybe a less regular scattering of horizontals might do the same job without looking so obviously artificial. The bottom ledge runs right the way around, while the others all extend only around three sides. On this side I've attempted a rock face, but it's not very convincing — it looks more like dirt. 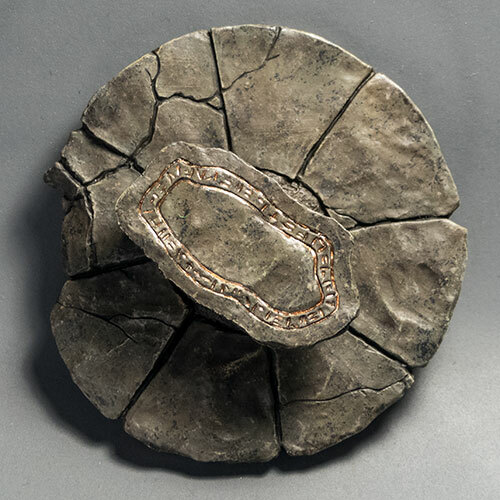 I have distant memories from childhood of setting plaster on scrunched-up tin foil to make a rocky texture, and as I recall it didn't look too bad, so I may give that another go. I've started another couple of hills, with the lessons of the first lot in mind. In the foreground is a long (about 800–900mm) rocky ridge. It's got a bunch of flat spaces and ledges in amongst the general rockiness, as it's supposed to be impassable to vehicles, but climbable by foot troops with appropriate climbing skills. The top half is slathered with my texture paint, which I've now remembered to actually add paint to. It's a mix of acrylic filler, paint and sand, painted and dabbed on to the foam, and it fills small seams and leaves a good ground texture. It's only on the top half at the moment, because I've just added a whole lot of clutter and rubble around the foot of the hill, and the acrylic caulk I'm using as glue (Selleys No More Gaps) isn't set yet. I tried gluing sections of this one with construction glue (Selleys No More Nails), and though it creates a very strong bond when it eventually sets, it takes a looooooong time to set. Especially between layers of foam; it's not really ideal for use in that sort of environment I think. There are probably more specialised adhesives that would work better, but the acrylic caulk does a good enough job for my purposes, and is a lot cheaper. The thing in the background that looks like a plate full of tofu slabs is a stepped ziggurat-style hill in its early stages of construction. When the caulk on that is set, I'll start carving and chipping it into more rounded hill shapes. It's going to be a lot less naturalistic-looking than any that I've done as yet, as it's supposed to be climbable all round, so it needs to be stepped all round so that figures can stand on it. Figures are 15mm WW1 British 18pdr and crew from Peter Pig. 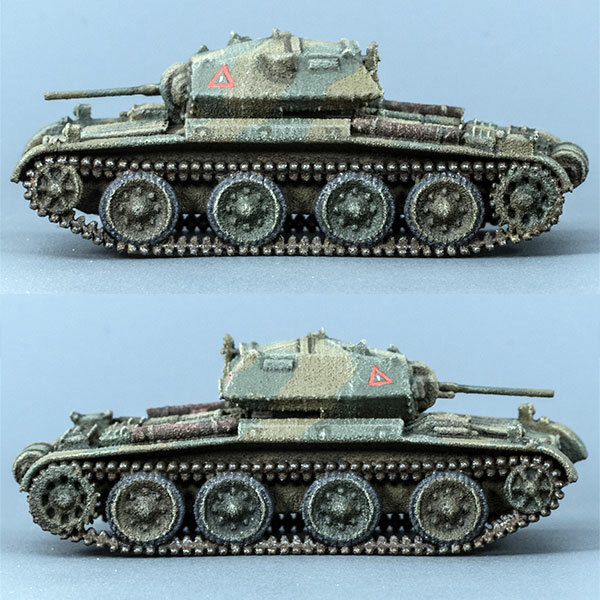 The tank is my own 3d-printed A1E1 Independent. Background is a hideous fluorescent GW "grass" mat. I've put together another couple of experimental hills. Number 1 we've seen before. Hill #2 has a mix of steep, impassable faces and more-or-less flat terraces that a figure could stand on without immediately tumbling down. It's a bit more usable than Hill #1, while still remaining reasonably naturalistic, but to be truly playable it probably needs to be blockier still. Apart from the flock, vegetation is pretty minimal — just a few areas of clump-foliage — and I think I may add a bit more to make it look a bit less... spotty. I may also have to hit it with the airbrush, as the flock looks a bit more pallid than I'd hoped, but I'll give it another couple of days before I do that as it may just be that the PVA holding everything together isn't properly cured yet so it's still a bit white. We've been having some cool, wet weather lately, and that has really slowed things down. 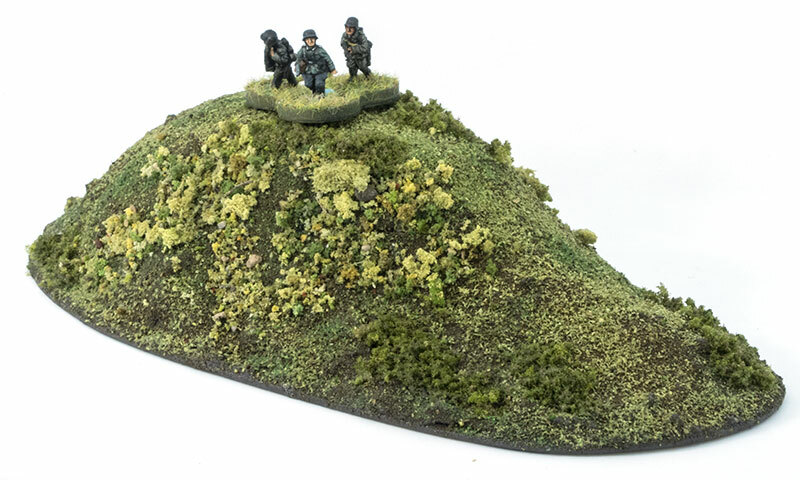 Hill #3 is a two-peak hill; the upper one is steep, with a flat top to allow figures to stand, while the bottom one is much more gently sloped. The slope is still too much for single figures, but vehicles and figures in movement trays will rest there without sliding back down. There's no foliage on here at all except for the flock, which is fine. They're all sitting on a GW "grass" mat that I picked up cheap some years ago, and have never used because it looks nothing at all like grass. I live in a Land of Grass, and I've never seen grass that looks anything like that colour. Add to that the fact that it sheds worse than a cat in moult, and it's just bloody awful. 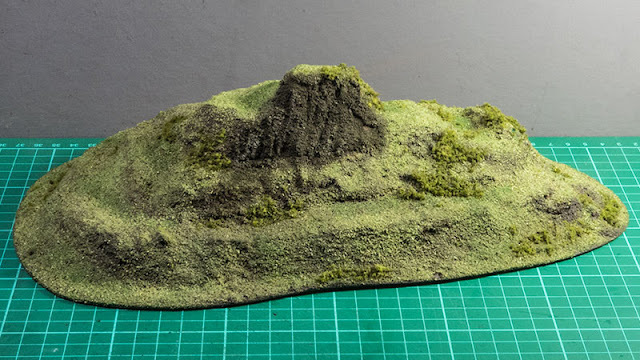 I finished off the first of the experimental hill terrain pieces I started yesterday, and it's shown me a thing or two. The first is that when the weather is crappy, as it has been for the last few days, diluted PVA takes a long, long time to cure. The second is that, though nicely rounded hills are attractive, a series of flattish levels is more playable. On this one, only the flattest slope is feasible for placing troops, and then only if they're supported in a movement tray like these ones. 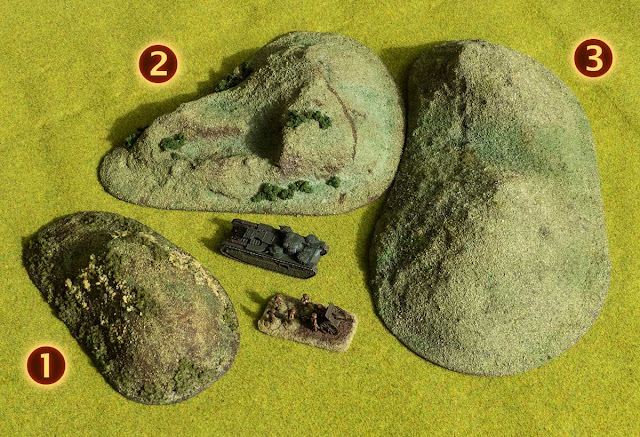 This terrain piece would be effectively impassable on three of its four sides, even for infantry, but that's not too terrible a thing — it's good to have the occasional piece of blocking terrain that troops can't just clamber over as if it weren't there. Not too many though. It has a flattish bit right at the peak to create a blindingly obvious point for a FAO or sniper to sit and then be mortared into oblivion. I'm not unhappy with it, but it's only a partial success. Fortunately, I have lots more insulation foam to play with. Something I don't have any of in my 15mm terrain collection is hills, so I thought I'd whip some up out of whatever I have handy. These are made from 50mm insulation foam, carved to shape with knife and rasp, and smoothed with a blow-torch. 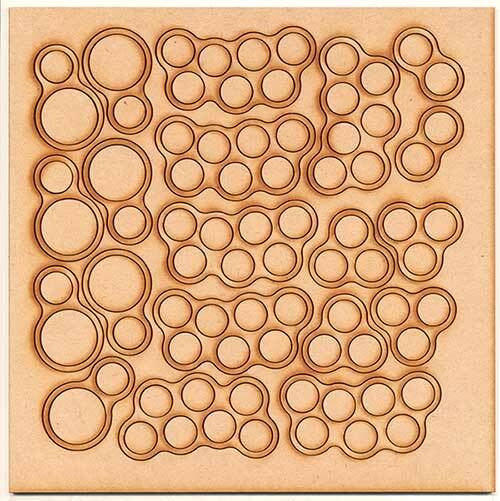 Then they're glued to 3mm MDF, and slathered with textured acrylic filler — basically just diluted ready-mixed filler with a couple of handfuls of sand mixed in. I realised after I'd mixed it up that I probably should have put some acrylic paint in with it, but I forgot. The weather has taken a turn for the worse, so the texture coat is taking forever to dry. I really want to get on to the painting and flocking, but at this rate it'll be tomorrow at the earliest. Gosh durn it. These finally arrived from Battlefront. They don't keep their online store stocking status up to date, and if one orders something according to what appears to be in stock on the website, they just take your money and put it on back-order until it really is back in stock. 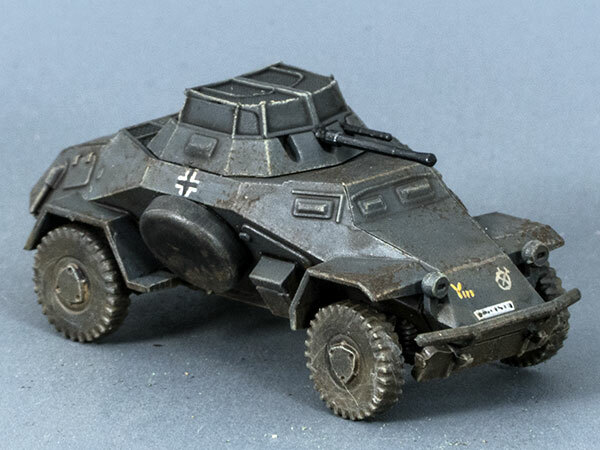 It's symptomatic of Battlefronts steadily decreasing level of customer service, especially (or so it seems) for the New Zealand market, and one reason why I will go almost anywhere else than to them for my 15mm stuff these days. Here are some of those laser-cut MDF sabot bases from Ponoko in use, after painting and flocking with the same static grass I used on the figure bases. I've glued light black cardboard beneath; it's sturdy enough to take a bit of wear and tear, but thin enough that it doesn't appreciably add to the overall height of the bases. Plastic card would be usable, but the benefit of cardboard is that it can be glued permanently to the MDF with PVA. It's thin enough too, that the magnetic sheet I use for storage can still grab the steel of the washers the individual figures are based on. It's not a strong attraction, but it's enough to keep everything in place against a normal degree of jostling. For a more rock-solid connection, I can glue a very thin steel shim in the bottom of each cavity, and use a 1mm thick rare-earth magnet to hold the figure in place. That's a strong enough attraction that the whole base can be shaken quite vigorously, and the figures will remain in place. It's a lot of trouble though, and I'd only do it if it was really warranted. Here's one I've prepared with some steel shim and magnets. I don't know the exact thickness of the shim, but it's thin enough that I can cut it with a regular pair of scissors. It's just glued in the cavity with a drop of liquid superglue. The magnet is 10x1mm; I got a batch of them very cheap from China a while ago. I use them mainly for holding figures to the bolts I use as painting holders, which is why this particular one is so grubby. I have some 3x1mm magnets as well, and they're quite strong enough for this purpose, but the wider surface area of the 10mm magnets makes everything a bit more stable. With the magnets holding everything together, I can pick up the whole base by one figure (if I wanted to be that cavalier with my paint-job) without any risk of everything falling apart. 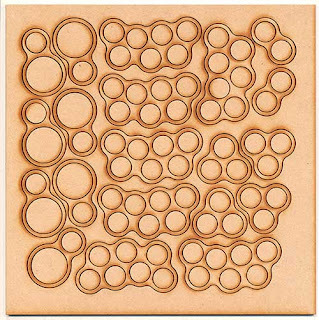 Note that there's no real reason, except aesthetics, to cut the shims in a circle. A square will do exactly the same job, and is a lot less trouble. Of course, I could glue the magnets directly to the base of the sabots, but I like to have the option of using them unmagnetized if that takes my fancy. I'm a fan of flexibility in use wherever possible. 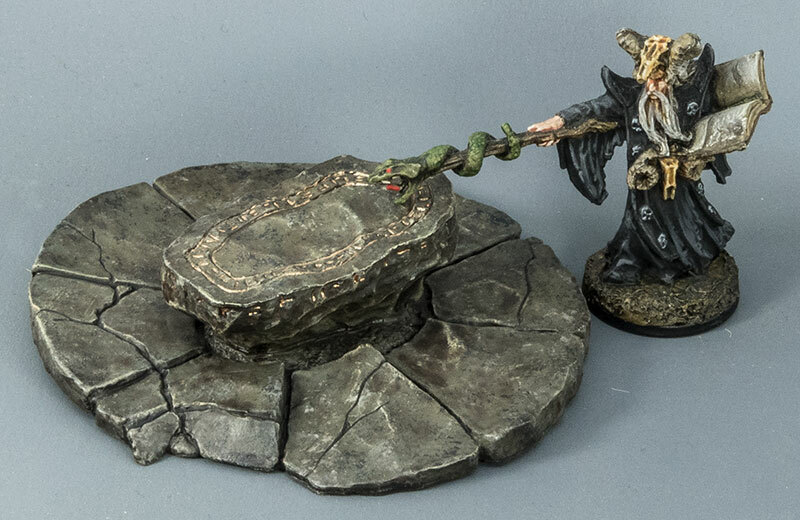 This is a piece that came in the Mythos expansion pack to the Reaper Bones III kickstarter, a good old-fashioned stone sacrificial altar. Tim the Enchanter I've shown before; he's just there for scale. 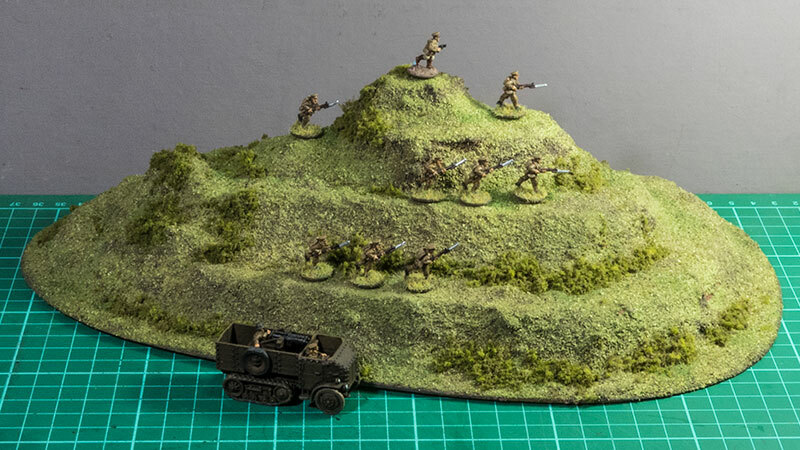 This is the sort of terrain piece that comes in handy quite a lot. I can foresee getting plenty of use out of it. Unfortunately, I'm a little short of terrified and helpless sacrificial victims; I shall have to see what I can do about that. I originally left the incised rune band dark, but I decided in the end to inlay it with some gold. I used Vallejo ModelAir Bright Bronze, which is very thin and very shiny. I find it quite difficult to do justice to shiny things with my limited photography skills; it looks much nicer in real life. 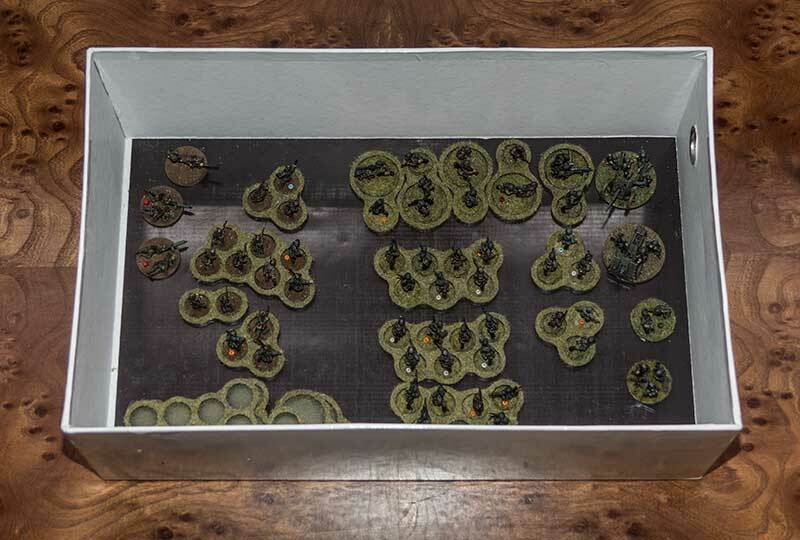 I'm a fan of basing my 15mm WWII infantry individually or in small teams on steel washers — I use magnetic sheet in a box for storage and transport, so the figures don't jostle against each other and knock all their paint off. Individual basing gives you a lot of flexibility about figure placement on the wargames table, but especially in larger games it can be a real pain in the Gentleman's Personal Area to move them all around. That's where sabot basing comes to the fore, allowing me to move entire squads as one until it actually becomes important precisely where the individuals are placed. 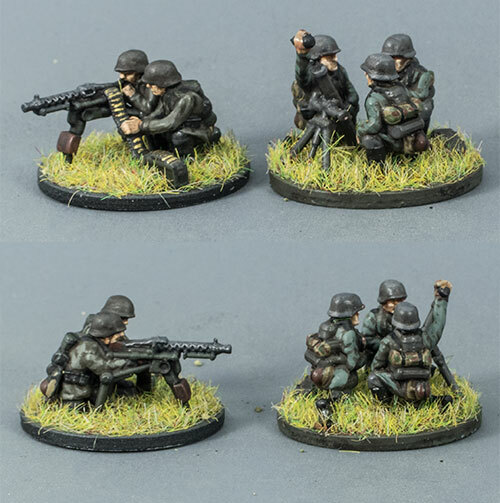 These sabot bases are designed specifically for German sections in the Battlegroup rules, consisting of two teams each: one seven-man element of riflemen, and one three-man element manning the section LMG. 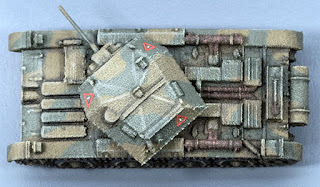 I mount the LMG teams as one single figure and another group of two on a larger washer; hence the difference in hole sizes in the LMG team sabot. I designed the bases layout in CorelDraw, exported the file to SVG, and had the bases cut by Ponoko. They have a making workshop here in New Zealand, and it took about four or five days from submitting the design to receiving the sheet of MDF. File submission was pretty straightforward, though I did have to make a change and re-submit it, because I initially forgot to set the SVG export file to convert all text to curves — I've used no text, but apparently it's important nonetheless. This sheet is quite small, only 181x181mm, and it was not inexpensive. I thought it was pretty dear to start with, but it got worse. I had not noticed that even though I was ordering from a New Zealand address to a New Zealand-based workshop, all the pricing was in US dollars, nor that GST wasn't included, nor postage. This little sheet ended up costing me about $NZ50.00, which is far too much. The image above shows one side of the cutting, the photo to the left shows the other — I don't know which is the entry or exit side for the laser beam. This side, the dirtiest, is protected by a sheet of adhesive paper. The paper peels away quite easily, and the protected surface is perfectly clean. The edges, of course, are burned dark. For this particular purpose, that's advantageous, but that might not be true of other multi-piece construction projects. I'll glue the MDF to thin card so that the figures don't just fall through, and add some paint and flock. I've used magnetic sheet underneath before, and though it does give the group a little more stability as I move them around, I don't think it's really worth the extra trouble; the figures don't tend to fall out all that often even without the slight magnetic attraction of the sheet. I'm more than happy with the quality of Ponoko's work, and their service was pretty prompt and relatively trouble-free. However, the pricing is far beyond what I'm happy with, and I doubt that I'll do it again. Or at least, not until the costs get a lot more reasonable. 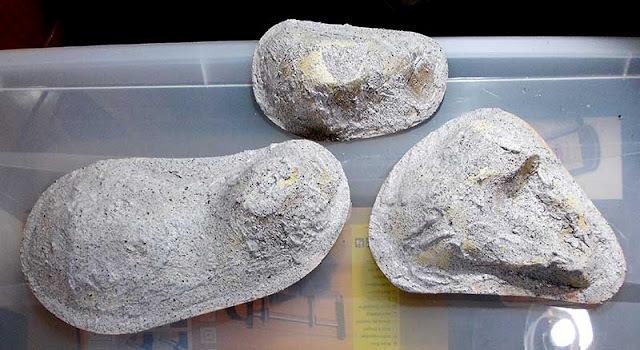 This lot have been saturated with dilute PVA glue to make them durable. In this weather it takes a day or two for them to dry thoroughly. 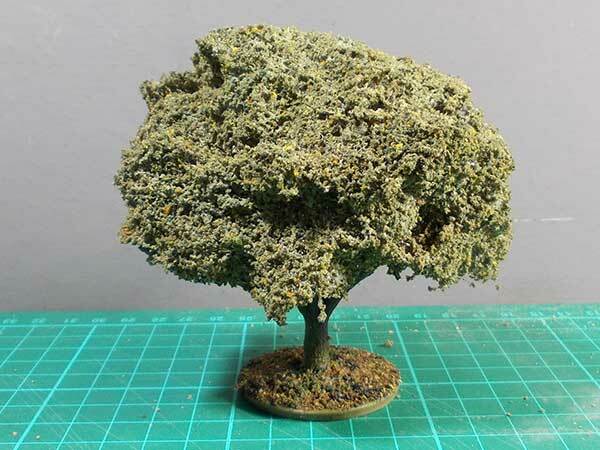 I'm exercising my god-like powers of creation to build some more trees. 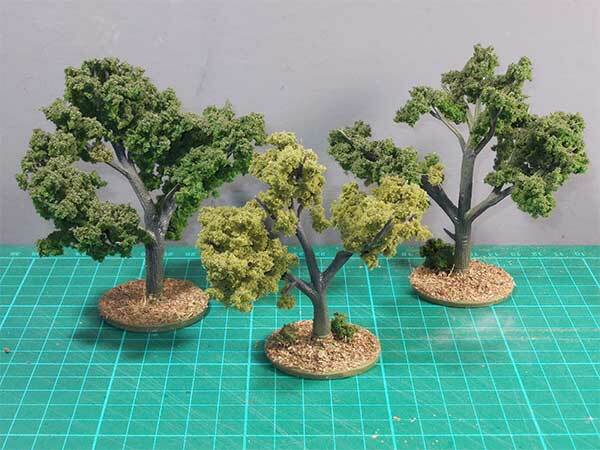 These ones are based on Woodland Scenics' tree armatures, which are reasonably cheap, and make things pretty quick and easy. 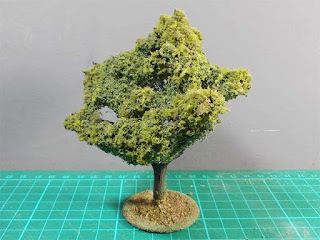 They're a semi-soft plastic that can be bent and will hold its shape, so though they're moulded flat, they can be manipulated into a more three-dimensional form before any foliage is added. I've glued the plastic armatures to thick, heavy 40mm steel washers, so they're pretty stable. It's not impossible to knock them over, but they don't fall down at the merest quiver. I've made some before with these armatures, by gluing clump foliage directly to the branches, and the finished effect is OK but the foliage tends to look a bit sparse, and it's quite a labour-intensive process as each clump has to be glued individually. Also, it's quite expensive compared with my current preferred method, below. This method uses dacron wadding (the stuff used to pack teddy bears and duvets), teased out cobweb-fine and stretched out across the branches. Then it's sprayed a tree-ish colour before being dusted with spray-glue and having flock dropped over it. This one has had two flock coats; one of green sawdust flock, and a second of a coarse-ground foam flock. After all the flock has been applied, the whole thing is saturated by spraying it with diluted PVA glue. Once that dries, the finished tree model becomes quite durable, and the flock stays put where it's meant to be instead of scattering itself far and wide. Steel wool can be used in the same way as the dacron wadding, and already being a dark grey it doesn't absolutely need to be painted before the flock goes on. 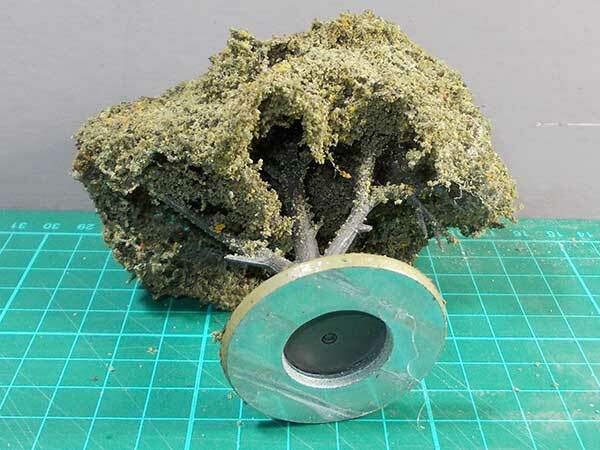 The effect is pretty similar in the end, though the steel wool just rests on the armature branches until it's glued in place by the PVA spray — it doesn't hold itself under tension like the springy dacron fibres. 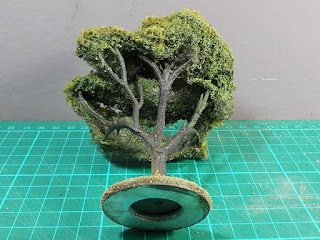 It's easier, because of that, to shape the canopy, and it gives a generally more rounded appearance to the tree. These two are dacron, and you can see that the fibres stretched over the armature give the canopy a sort of faceted appearance. That can be ameliorated a bit by applying the dacron in smaller pieces, rather than trying to cover the whole thing in one wad. When building up a canopy from small bits of dacron, I found it useful to give the whole thing a good spray with ultra-cheap hairspray, just to hold everything together through the flocking process. 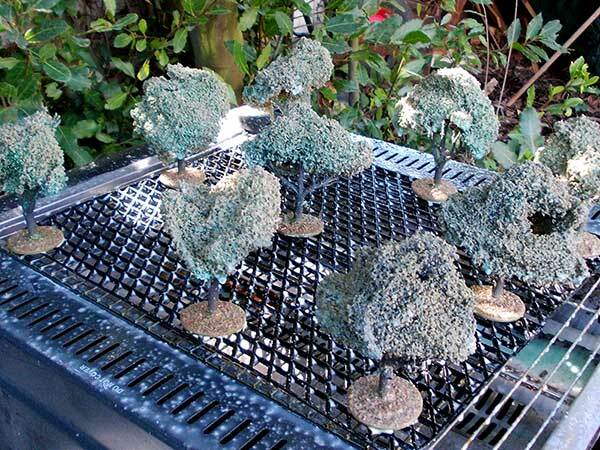 These ones, like the steel wool tree above, have just had a single layer of a foam flock added — it's a railway modeling flock called Dark Tussock which I think is made locally (or at least, in New Zealand), so may not be available overseas. Something similar will be though. This arrived on my doorstep this morning — a 1:100 scale (15mm) Zvezda SdKfz 222, a German light armoured car of WWII. As always with these little Zvezda kits, it's a snap-together affair. This one was trickier than most to build because quite a few bits interlock, but even so it was a pretty simple kit to slap together. 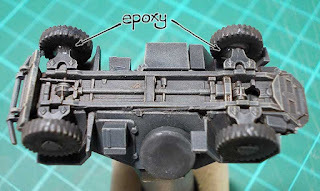 Something I've found with most of Zvezda's wheeled vehicles is that the axle stubs are a little fragile, so I generally reinforce them by slathering the connection with a boot of 5-minute epoxy. That gives them enough strength to stand up to my ham-fistedness when they're on the wargames table. Another modification I made was to chop off the turret's peg and add a couple of magnets to allow the turret to turn freely. 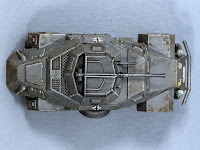 It's not always necessary, but I thought it a wise precaution in this case because the barrel of the 20mm autocannon is so slender; I don't think it would stand up to some clumsy oaf trying to turn the turret by it against any sort of friction. Now that I've photographed them in close-up, it becomes apparent that they need a bit of dusting. 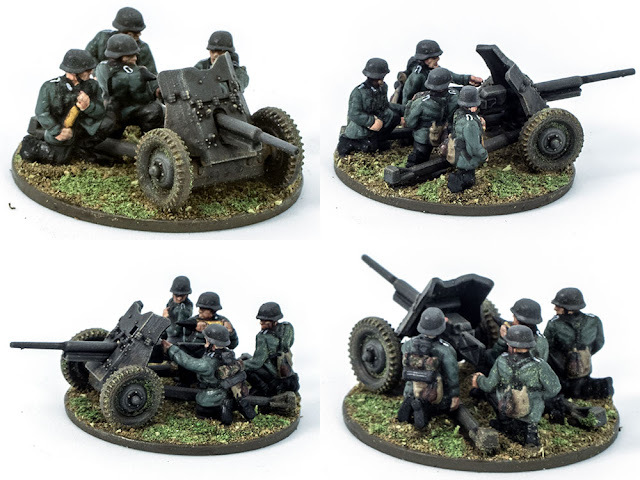 The last of the teams on the PSC 15mm Early WWII German Heavy Weapons sprue is the PaK36 37mm anti-tank gun. 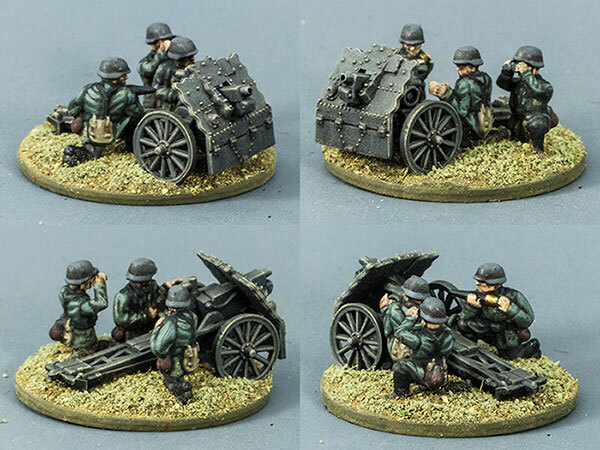 I put this one together and painted it, not because I need more PaK36 right now, but because I thought I might as well just to see how it looked complete. It's a fairly creditable little model, I think. Very simple to build, and it looks exactly like what it says on the tin. Unlike the other team weapons from this set, I painted the crew separately and then added them to the base (a 32mm steel fender washer). That made them a million times easier to paint, and I think I did a much better job on them. I had to glue them to little bits of plastic card to make them handleable, as they're not moulded with bases — which I think isn't actually a terribly good idea, but there you go. I think I might as well do the remaining three in the set, as my existing PaK36 teams are all SS, and I hate those pricks. The crew figures appear to be generic rather than PaK36-specific, so their shells are much too big for the gun. I can live with that, but it would have been nice for them to have ammunition a bit closer to the proper size. 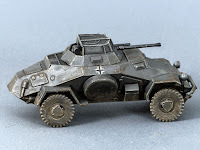 The last of the PSC early-WWII German infantry heavy weapons for today are the tripod-mounted MG34 and the 80mm mortar. The MG34 seems to be being served by the world's most incompetent loader, since he appears to have just jammed the belt down under the loading cover rather than actually feeding it into the loading gate. I didn't notice that I'd mis-positioned him until after I finished painting the team. Ah well, next time. Both of these were, again, mounted on fender washers before, rather than after painting. That's not something I'll try again. 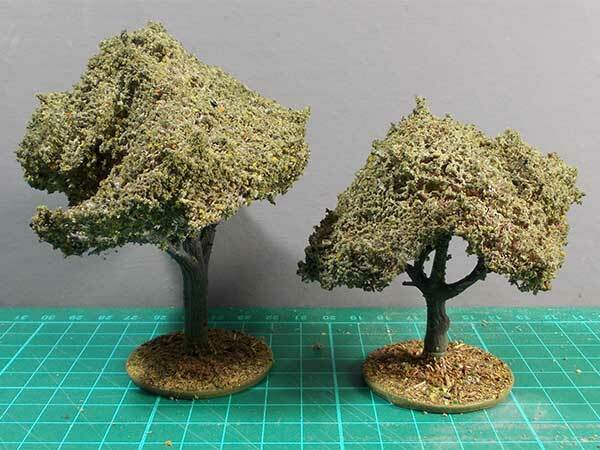 I'll probably be moving to flock for the bases rather than static grass too; I prefer the way flock handles and looks, not to mention that it's a lot hardier. Here's another lot from PSC's 15mm early-WWII German infantry heavy weapons box — the leIG 18 75mm infantry gun. Everything is mounted on a 32mm fender washer, and I mounted them before painting, which was an error.The figures have no bases, which makes them problematic to hold while painting, but even so I think I would have been much better off trying it, because painting them in situ was a major pain in the Gentleman's Area. 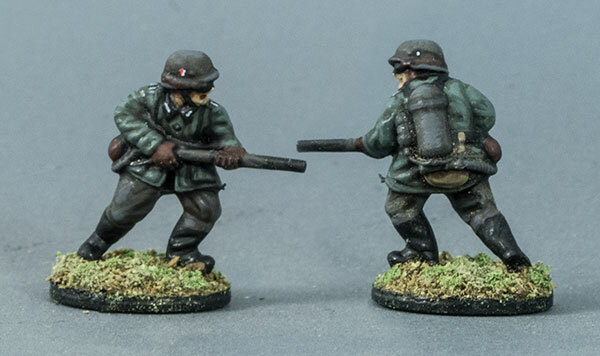 I recently got some stuff from the Plastic Soldier Company, amongst which is a set of their early WWII German heavy weapons, and amongst them is this flamethrower figure. 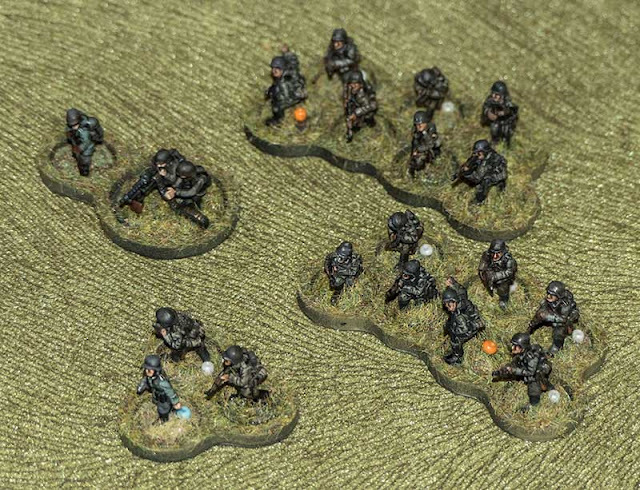 It's fairly representative of the standard of PSC's infantry figures. 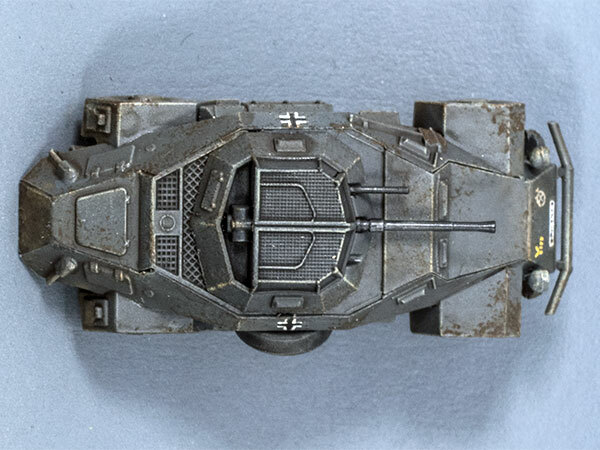 Size and proportions are generally OK, though there are some odd quirks, like the bulginess of this guy's back to the right of the flamethrower tank. 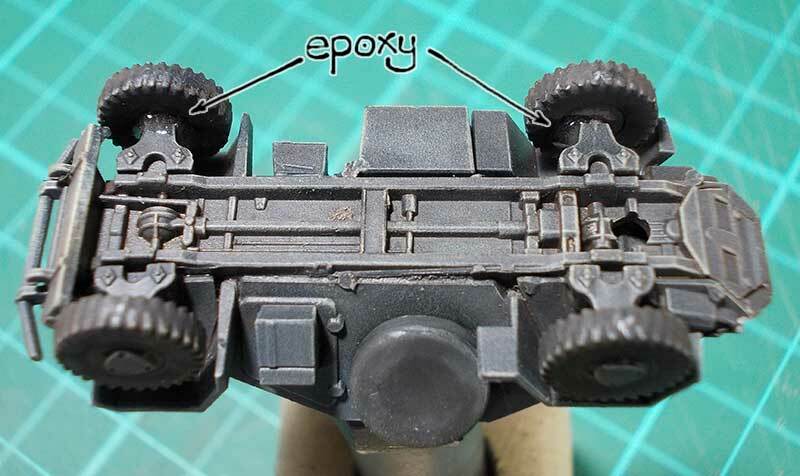 Detail is pretty soft though, and the poses tend to be quite flat to cater to the limitations of injection moulding. 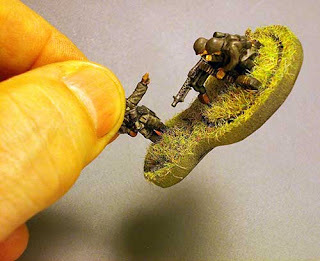 They're intended as wargaming figures, and in that role they serve perfectly well. They're not in the top rank of quality as far as detail and animation goes, but for their intended purpose they don't really need to be. They do take a bit more painting than figures with crisper, cleaner detail, so be prepared for that if it's something that is important to you. I've yet to see any of Battlefront's plastic figures, PSC's only real competitor so far in the field of 15mm plastic figures, so I can't make any comparison except on price. 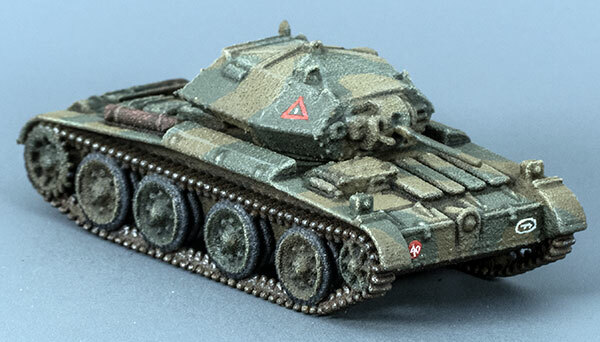 The BF plastics are considerably more expensive and less comprehensive than PSC's offerings. If you want superior detail, metal figures will probably have the advantage, but again you'll be paying a lot more for them, and quality there is far from guaranteed — I've seen some truly awful metal figures. In summary, I think they're OK. Not stellar, but OK, and worth the asking price. 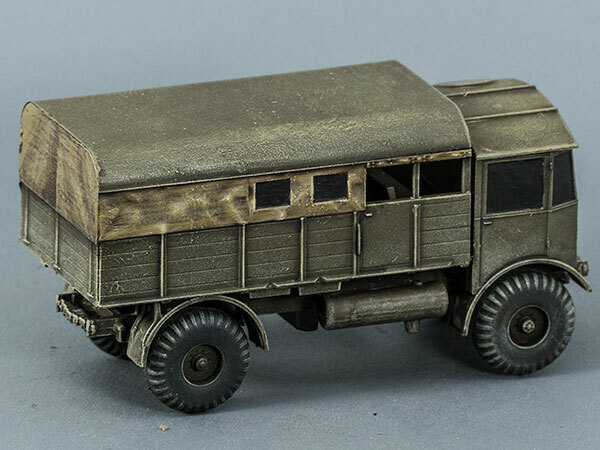 I've added a couple more trucks to my 15mm 1940 B.E.F. truck fleet. In this case they're actually 1:100 scale Soviet Zis 5 trucks by Zvezda, but they're generic-looking enough for my purposes to be requisitioned civilian Fiats or the like. 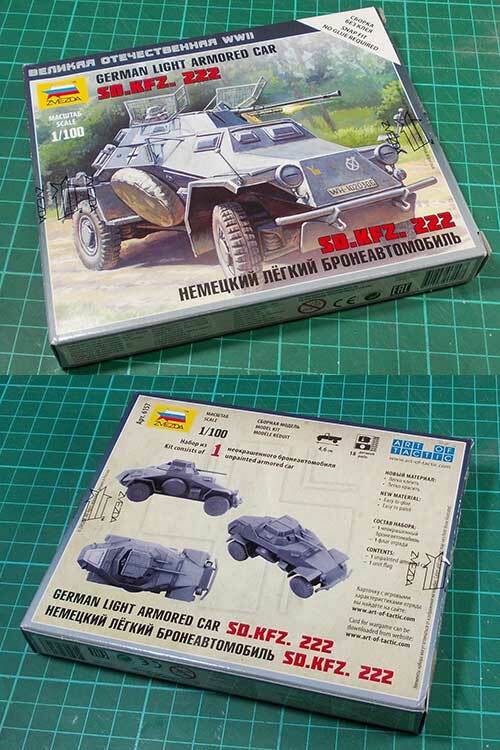 These are snap-together kits, and not too bad for the price, but they do lack detail on the sides of the canopy and cargo bed (just like their Opel Blitz model). I've painted in some drapery in the canvas, and drawn in the planking with a 0.1mm technical pen. 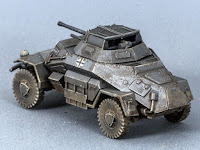 A few years ago I bought a whole lot of 15mm Universal Carriers at the Christchurch Wargaming Club's annual bring-&-buy. They were very cheap; I think they cost me about a buck each. There were 18 of them, but one of them fell casualty to an over-enthusiastic paint-baking experiment, so now there are 17. I painted up the three you see in the centre foreground (with the BEF's white square recognition patch) pretty much straight away. At that time I was using the wrong base colour for British equipment; from memory it was Vallejo Russian Uniform, which is much too green. I finally got around to finishing off the remainder in plain overall Khaki Green #3 with no disruptive Dark Green #4 overlay, mainly because I wanted to get them out in a hurry. If I get the urge, I may go back and add the disruptive pattern later. Out in front of the column are my 3d-printed Carden-Loyd MG Carriers, in all their clanking obsolescent glory. I rather doubt there were any with the BEF, but there were a few (briefly) recalled to increasingly rattly service back in England after the enormous equipment losses of Dunkirk. 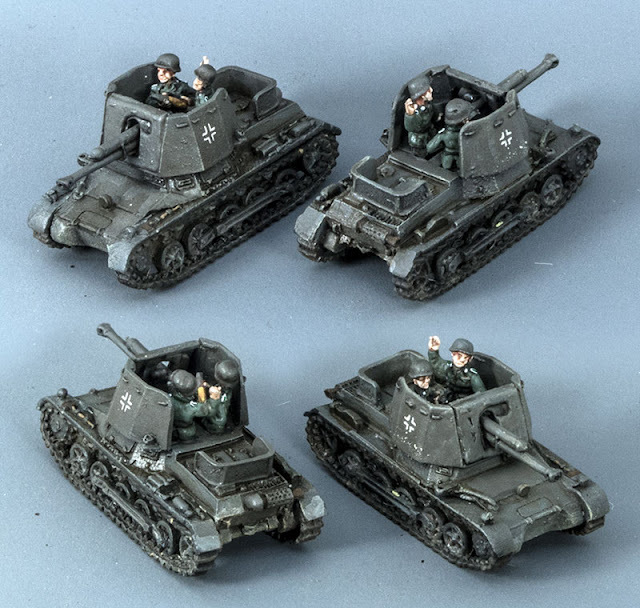 I bought some more transport for my 15mm WWII Brits. 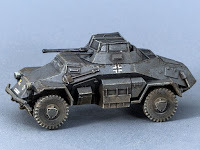 This is the Matador heavy truck from Zvezda. It was used as an artillery tow, and as troop transport. I have vague memories of building the Airfix model, along with the 5.5" howitzer it towed, back in the distant past when I was a kid. Most windows are solid, but two on each side are cut out.